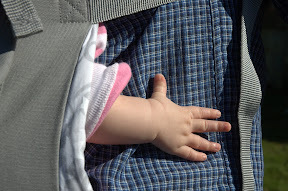 I ran into some friends I know from Habitat for Humanity who were out for a walk with their 10-week old baby in a carrier. We got to talking, and I showed them the map of the cemetery which shows the locations of some of the interesting people buried at Mountain View. 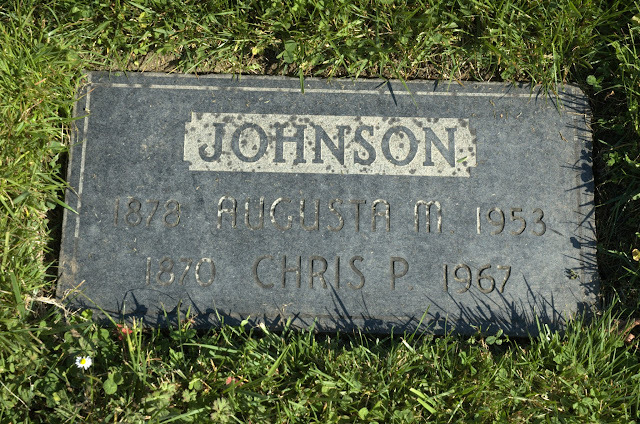 A few side trips later, I did make it to plot 66A and found the Johnson Grave. The entire plot is markers that are flat with the ground, like in plot 54. In theory, this makes it easier to maintain, as you can just run a lawnmower over everything, but in practice it was found that flat stones have a tendency to sink over time. It also makes it harder to find graves, as from a distance there's nothing distinctive about any of them. Plot 66A is in a lovely area, and though it doesn't have the sweeping vistas of nearby "millionaire's row", the views aren't too shabby. But then I was off to check on something else I'd seen...a truck with a compressor and sandblaster working on a gravestone nearby. I talked for a while with Dale, the owner and chief of Gateway Memorials. He was mostly done by the time I got there, but I learned a bit about the marking of gravestones. 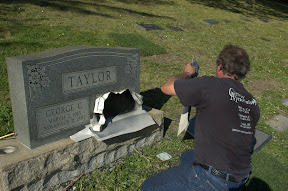 Whether they're working in the shop on a new marker or in a cemetery on an existing one, they use a heavy, slightly adhesive sheet of rubber as a mask. What's not covered gets sandblasted, then painted with black or white paint. It turns out Dale's company also does work in Kaua'i, so it's entirely possible I've seen some of their work when I was there last summer. I did some more looking around plot 66A, and then realized I didn't have time to go to Saint Mary's Cemetery, too, so I might as well make the most of my time here. I checked the map again to see what other well-known markers I could visit that I hadn't seen before. 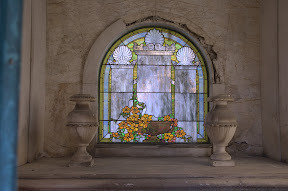 I went along the row of mausoleums below "millionaire's row". From there I swung past the Folger (of Folgers Coffee) plot then back to find the mausoleum of David Hewes, who was an associate of The Big Four, and lived for a time at Camron-Stanford House on Lake Merritt. Oh, look, some of the Camrons and the Marshes are just down the hill. And Ina Coolbrith—I think I've seen her grave, but do I have a picture of it? After only a few more side trips, I eventually left the cemetery. But as usual, I had a few answers, but I had even more questions than when I'd arrived. At least for a change, I'd actually found what I was looking for instead of getting completely sidetracked.